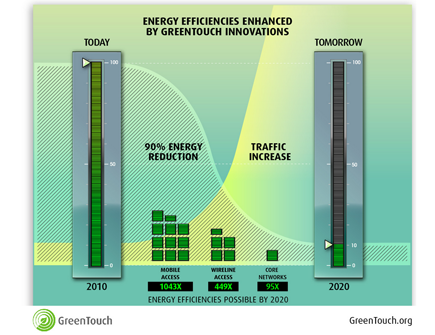 The goal of a 90% reduction in network energy consumption by 2020 compared to a 2010 baseline is achievable, according to a new study published by the GreenTouch Consortium, a global research initiative dedicated to dramatically improving network energy efficiency. This remarkable cut in electricity can be achieved while accounting for the dramatic increase in network traffic over this same decade. GreenTouch said its study applied advanced modeling to better understand potential network operations in 2020 in comparison to those in 2010. Mobile networks stand to benefit the most from energy efficiency efforts, as they are the most inefficient and yet the fastest growing networks in terms of data volumes. Mobile networks could realize potential energy efficiency improvements of up to 1043 times. Energy efficiencies in fixed-line and core networks are also expected, but will be less dramatic. The modeling shows potential improvements in fixed access networks of 449 times and improvements in the core network of 95 times. Core networks are already relatively energy-efficient, so further gains will be less significant and much harder to achieve than with mobile networks. Infrastructure sharing by mobile network operators. Small cell deployments in cities. Less energy is needed to transmit data over shorter distances. Discontinuous transmission during periods without traffic. Bit interleaved passive optical networking (Bi-PON), a new protocol that would use TDM to more efficiently move packets to their intended destination. Dynamic allocation of resources in the network core to diurnal traffic fluctuations. Power models for energy efficient hardware and network equipment. Gains from Moore's Law. Additional technologies that could add even further gains beyond those calculated by this study include the separation of the control plane from the data plane, and further optimization of Content Delivery Networks (CDNs). The GreenTouch Consortium, which was founded in 2010, has grown to include a wide range of participants, spanning the research community, academia, global service providers and networking equipment vendors. 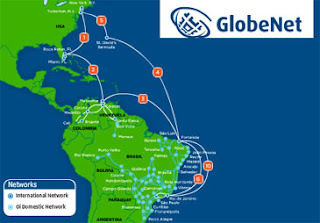 GlobeNet, a wholly owned subsidiary of Oi (formerly Brasil Telecom), has extended its low latency network into Equinix’s MI3 International Business Exchange (IBX) data center in Boca Raton, Florida, opening up the fastest IP traffic route from the United States to Brazil. Equinix’s MI3 facility serves as a carrier-neutral network access point for GlobeNet to connect its low latency, subsea cable route from Equinix’s SP2 facility in São Paulo, Brazil. Equinix said undersea cables are typically terminated at a landing station. The new arrangement with GlobeNet brings its undersea fiber connectivity directly into the Equinix data center in Boca Raton. The companies noted that roughly 75 percent of all network traffic emanating from Latin America enters the United States via Miami. Globally, MI3 has the sixth highest Internet capacity and is a key hub location for domestic and international traffic routes. As a result, Equinix and its Brazilian subsidiary ALOG are perfectly positioned to serve high-bandwidth events, such as the upcoming 2014 FIFA World Cup and 2016 Summer Olympics in Brazil. "Fueled by the convergence of telecommunications infrastructures, MI3 is becoming a popular connectivity hub for global carriers, Internet service providers and other Internet-related businesses and organizations. We are thrilled to have GlobeNet expand into MI3, opening up a new bilateral submarine connectivity opportunity for major network providers," stated Jim Poole, general manager, Global Networks & Mobility at Equinix. Samsung Electronics is testing adaptive array transceiver technology operating in the millimeter-wave Ka band at a frequency of 28 GHz at a speed of up to 1.056 Gbps to a distance of up to 2 kilometers. The company said the technology will be the core of future 5G networks. The new technology sits at the core of 5G mobile communications system and will provide data transmission up to several hundred times faster than current 4G networks. Samsung's adaptive array transceiver test combines 64 antenna elements, enabling the system to overcome the radio propagation loss at millimeter-wave bands, much higher than the conventional frequency bands ranging from several hundred MHz to several GHz. Samsung said plans to accelerate the research and development of 5G mobile communications technologies, including adaptive array transceiver at the millimeter-wave bands, to commercialize those technologies by 2020. The Optical Internetworking Forum has started work on an SDN Framework document to better focus the conflicting and confusing requirements that vary in the industry for Transport SDN. "The OIF is working on defining a framework for the industry to clarify the interfaces required in the Transport SDN ecosystem, leveraging input from carriers,” said Jonathan Sadler, Tellabs and the OIF’s Technical Committee chair. “In addition, the OIF is advancing work in 100G interconnect and has completed implementation agreements that focus on technology from past interoperability demonstrations. The Forum continues to drive technology efforts that are necessary for providing higher speeds and lower costs for the industry." The OIF is also working on plans for an SDN networking interoperability demonstration for 2014 and will showcase technology outlined in the SDN Framework document. At the Physical and Link Layer (PLL), the OIF is undertaking two projects addressing Thermal Interface requirements and CFP2 Coherent Optics Transceiver module. The first project will specify a module-type agnostic thermal interface between anoptical module and a host bringing consistency and standardization to the industry. A second new project focuses on a Coherent Optics Transceiver module in a CFP2 form factor and will help maximize faceplate density and minimize first install costs on metro/regional line-side transport or switching platforms. OIF members completed and approved the Next Generation Interconnect Framework white paper as well as implementation agreements on Multilink Gearbox and a Multilayer Amendment for E-NNI. The Multi-link Gearbox 2.0 implementation agreement defines a 4x25G lane configuration comprised of 20 MLG lanes and an 8x25G lane configuration comprised of 40 MLG lanes. Both are configured to carry multiple 10GBASE-R signals or a single 40GBASE-R signal. This IA will serve as an important infrastructure element in high rate systems. A second IA, the Multilayer Amendment defines generic signaling and routing extensions to the OIF’s E-NNI 2.0 implementation agreement in support of multilayer networks. Based on technology demonstrated in past interoperability tests the Multilayer Amendment provides the ability for the control plane to determine the lowest cost way to deliver a service using different technologies. Level 3 Communications is introducing a Carrier Cloud Voice solution for CLECs, wireless carriers, cable multiple system operators (MSOs) and telcos. The service, which is offered in partnership with Alianza, is a complete outsourced voice solution for service providers that are looking for ways to add voice but avoid significant up-front investment and ongoing operational costs. The joint solution combines Level 3's Enhanced Local Service and Alianza's cloud-based voice platform, which includes a hardened set of APIs for back-office integration, billing and service management. "Voice is an important part of many established service bundles, but it is an expensive investment that consumes a lot of internal resources to manage," said Shaun Andrews, Level 3's senior vice president of Global Voice Services. "This complete, carrier-grade solution allows service providers to reliably realize the benefits of a cloud-based model. With several key customers already purchasing our joint solution, we know this value proposition resonates in the marketplace." "The next generation voice evolution has proven to be challenging due to network cost and complexity," commented Brian Beutler, CEO and co-founder of Alianza. "Working with Level 3, we have developed a complete turnkey solution with break-through economics that provides operators with a clear business case for simplifying voice delivery to their customers." roll-over data within any time frame (e.g. day to day or month to month); quotas that adjust or start over in the middle of a service plan. In addition, the Policy Server allows operators to replicate multiple groups of policy rules, increasing the speed of new service creation. Voice over LTE (VoLTE): Tekelec’s Policy Server gives service providers flexibility to request different amounts of bandwidth depending on the type of device and service. By allocating bandwidth based on the devices requesting it, operators can zero-rate voice traffic over LTE networks, manage voice sessions on IMS networks and implement quality of service controls for VoLTE calls. Enhanced support for Wi-Fi: The Policy Server recognizes when devices are on Wi-Fi networks, which allows operators to differentiate charging of services based on network access type. Analytics: Business intelligence such as which applications are most commonly used on certain brand names or types of devices, or patters on machine-to-machine (M2M) device usage. Prioritize communications for first responders during emergencies: The Policy Server supports the Enhanced Multimedia Priority Service (eMPS) standard in the 3GPP Release 10 specification. This prioritizes the quality of service for 911 calls and interactions to and from federal, state and local government officials. In March 2013, Oracle agreed to acquire Tekelec, which supplies network signaling, policy control, and subscriber data management solutions for telecom operators. Financial terms were not disclosed. Tekelec’s main solutions include its Diameter and SS7 Network Signaling platform, its Policy Control platform and its Subscriber Data Management system, which tracks dynamic subscriber data. The Diameter and SS7 Network Signalling offers integrated applications such as Local Number Portability, Equipment Identity Register, 3G to Voice over LTE Migration, load balancing, congestion control, and protocol mediation. In February 2013, Oracle agreed to acquire Acme Packet, a leading supplier of session border controllers, for $29.25 per share in cash, representing an enterprise value of $1.7 billion net of cash. Acme Packet supplies session delivery solutions to both carriers and enterprises. Oracle said it would make Acme Packet a core offering in its Oracle Communications portfolio to enable customers to more rapidly innovate while simplifying their IT and network infrastructures. BICS, a global provider of international wholesale carrier services, has selected the Infinera DTN-X platform to upgrade its Pan-European network. The BICS Pan-European network stretches across 9,000 kilometers of fiber in Europe and linking through a cable landing station in Marseille into the EIG & SEA-ME-WE 4 submarine cable systems. BICS offers international wholesale services through a network of 100 points of presence in 55 cities and 33 countries across the globe. The Infinera DTN-X delivers 500 Gbps long haul super-channels, enabling BICS to deliver flexible and cost effective 100 Gigabit Ethernet (GbE) services. "The Infinera DTN-X allows BICS to provide flexible solutions and ensures a faster service implementation, translating into a shorter time to market for our customers," said Johan Wouters, SVP Capacity Business Management at BICS. 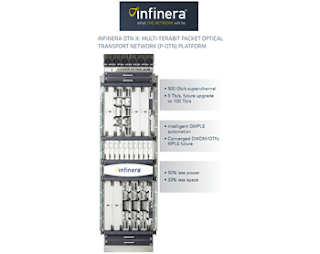 "This new platform will enable the aggregation of multiple high speed services on a single OTN interface. The advanced control plane offers the possibility of self-provisioning for high capacity services making BICS the perfect network outsourcing partner." 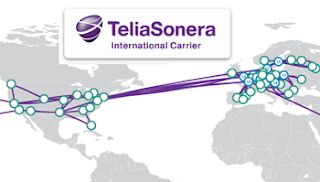 TeliaSonera International Carrier (TSIC) announced the launch of TeliaSonera IPX running over its 100G, fiber backbone with 200 Points of Presence (PoPs) worldwide. Available to both TeliaSonera group and external operators, at launch it carries TSIC’s roaming and signaling portfolio and VoIPX. This will be supplemented with LTE signaling services later in 2013 and a comprehensive suite of additional IPX services to follow. "Once people experience higher quality, they won’t be willing to go back. IPX is crucial to meeting the growing demands of mobile customers," says Veysel Aral, President of TeliaSonera Eurasia. "This is an important launch and shows TeliaSonera’s commitment to quality." SK telesys, the wireless system manufacturer of SK Group Korea, has integrated Symmetricom' SoftClocks with its small cell solutions. SK telesys produces and supplies repeaters that act as the core devices for telecom providers' CDMA/WCDMA services. The company's two small cell products, the SLN-FN080 and SLN-FD080, have integrated Symmetricom's SCr100 Small Cell SoftClock solution using network time protocol (NTP) signals. 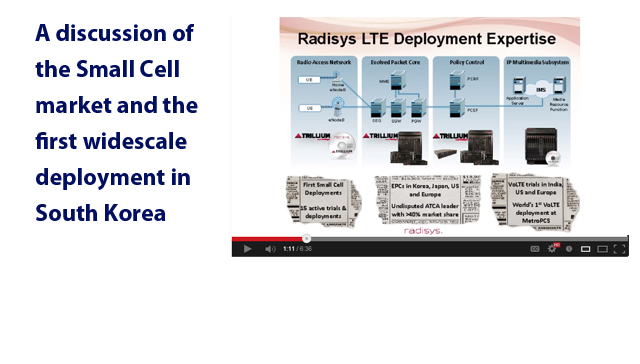 SK telesys will join Symmetricom's SyncWorld Ecosystem Program in the Small Cells category. "With the successful integration and induction as a Small Cells partner with Symmetricom, mobile operators can gain confidence that the various integrated components of our residential small cells solution will work at optimal performance," said Dr. IH Sohn, Director at SK telesys. "For telecom service providers, having Symmetricom's timing and synchronization element is critical, especially as they evolve to 4G/LTE networks."